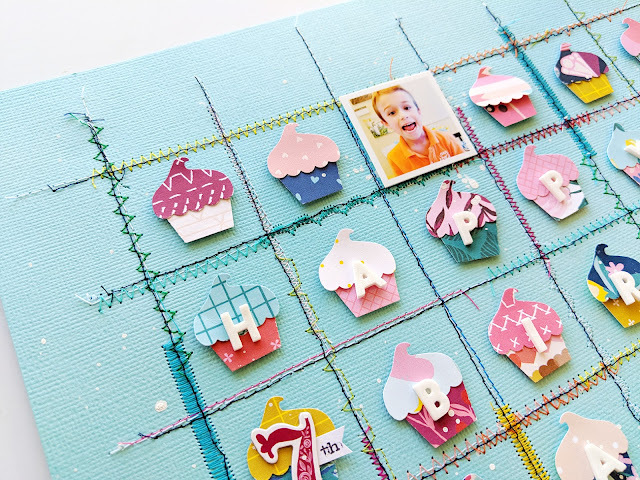 I started by making a bunch of cupcakes using a Fiskars cupcake punch. 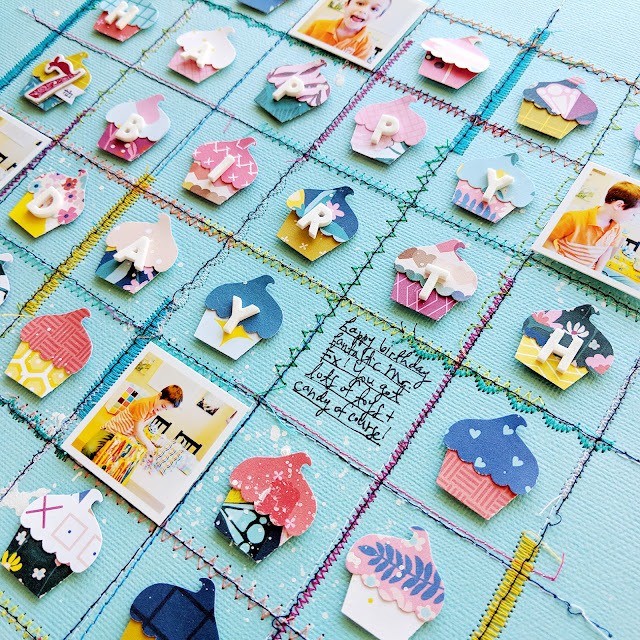 I punched one or two from every Pick-Me-Up patterned paper, more from Paper 10 which has all of the squares of different patterns. Then I chose a blue textured cardstock for the background and machine stitched lines every 1.5" across it to create a grid. I got a little crazy with more machine stitching and used a variety of colors of thread - I only switched the main thread color, I kept the bobbin white the whole time to save on time. I did a poll on instagram to see if I should leave the thread ends long like I sometimes like to do, or trim them up for a cleaner look. It was about 75% trim, 25% leave. I was going to leave them, but after continuing to work on the layout the threads just got in the way so I did end up trimming them and am happy with the results. Next I placed a cupcake inside each square using dimensional adhesive. 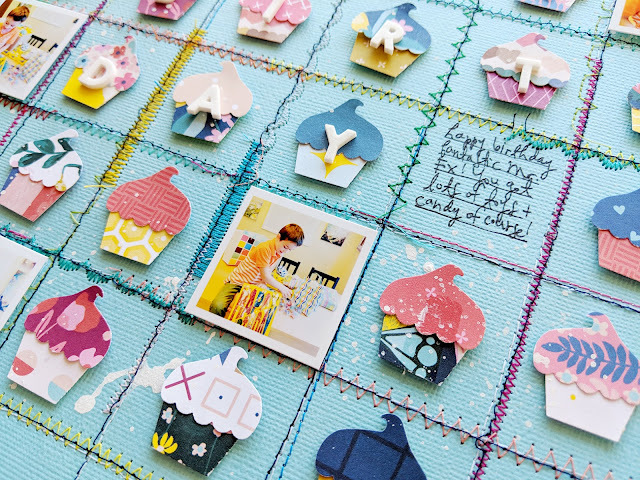 I printed five 1.5" square photos and placed them over five of the cupcakes. Then I created the title "happy birthday" using the white Mini Foam Thickers. I added a "7" Chipboard Thickers number and typed "th" on my WeR Memory Keepers Typecast Typewriter to complete the title. Next I splashed white acrylic paint under each photo. 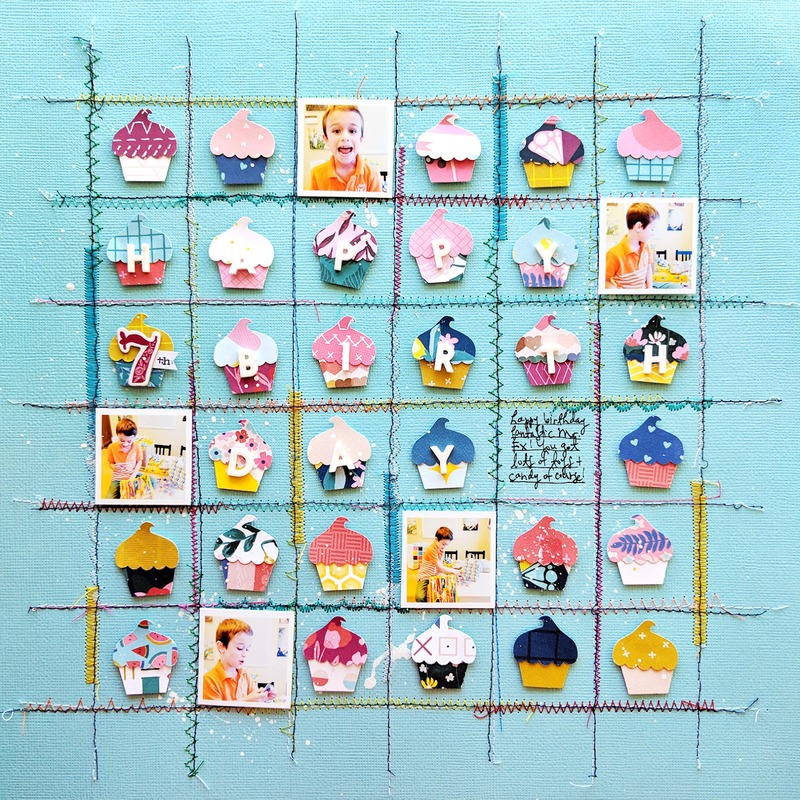 The last step was to remove one of the cupcakes and write journaling in that open square with a .03 black precision pen. I hope this layout inspires you in some way, whether it's to dust off your punches, play with the stitches on your sewing machine, or add five tiny photos to your layout! Thanks so much for coming by today! Well.... you have amazed me once again!!! :) I love love love love this so much! LOVING that grid design, the stitching (I struggle with that thread issue too! LOL!! ), and love love love the photos and cupcakes!!! Simply FABULOUS!!!!!!!!!!!!!!!!!!! This is so cute! Love those tiny cupcakes and the stitching is amazing! !